Everyone, please meet our new intern Christopher. Christopher, this is everyone. From the far north of Germany – home of the wonderful Flens – Flensburg we heartily welcome him here at Chasing Carrots! 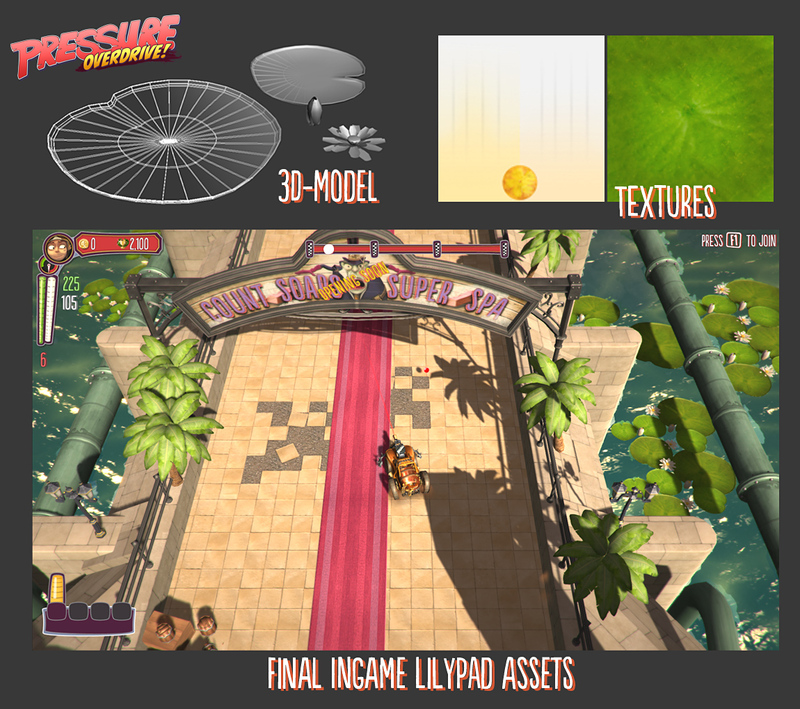 He’s already getting his hands dirty squashing bugs and implementing new features in Pressure-Overdrive & Heart of Scrap. So, cheers! Have a good time, Christopher! My name is Daniel and I’m one of the graphic artists here at Chasing Carrots. In my first blogpost I just want to show you some simple (but effective) stuff I created this week: Green huge lilypads for the ponds at the count’s castle. Hope you like it and stay tuned for more blogposts! Hey everyone! Our concept artist Chantal has got another treat for you. 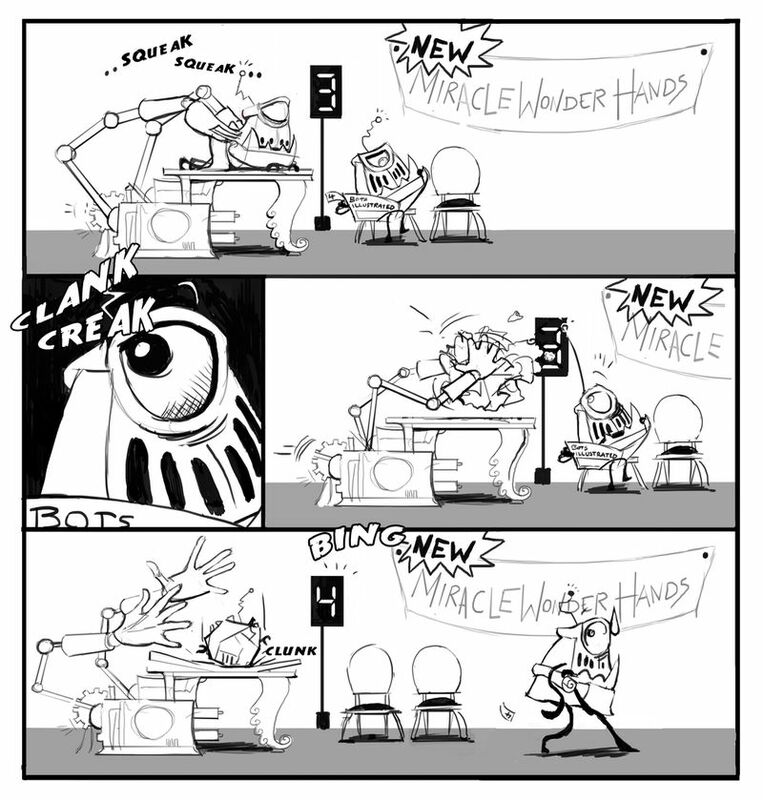 A new invention by Count Soap…the “Massage Hands of Doom”. While we are working on Pressure Overdrive, the inhabitants of its water-ridden world go on with their daily routines. Kind of. Funny things are happening there, which you shouldn’t miss. Sneak by and peek behind the curtains to see what Morgan, Tikki, Edgar de la Chose, Count Spa and his minions are up to – in a new comic strip series, drawn by our concept artist Chantal! Hi everyone, we are back at our studio in Stuttgart! How time flies by. 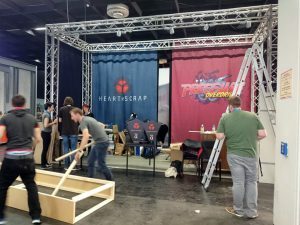 About a week ago, we were constructing our booth out of countless (mostly) handcrafted elements in hall 10.1 on the koelnmesse areal – which took us hours of screwing, attaching, glueing, connecting, fixing and adjusting. 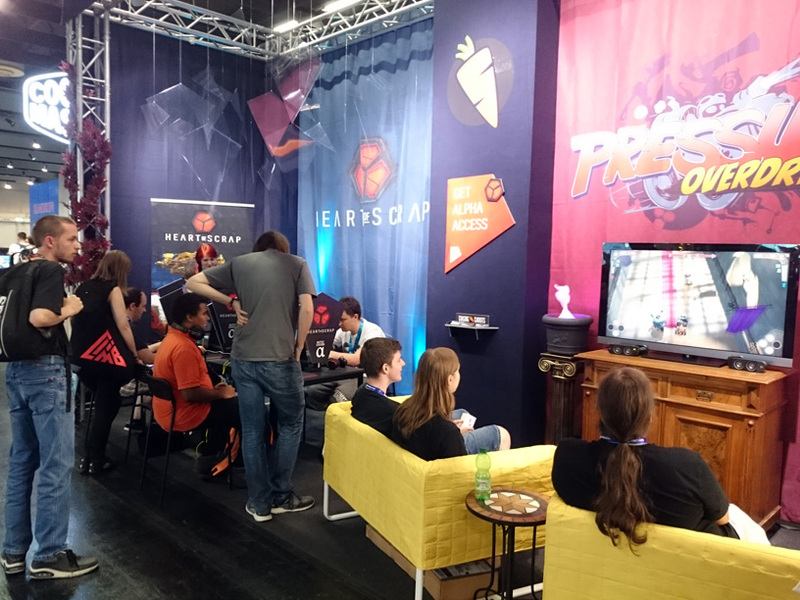 But eventually, we finished our first stand-alone booth, after we have attended Gamescom for two years as part of the Indiearena Megabooth. It really was worth the effort. We can humbly say, that our place certainly had its very own appeal, amongst the other exhibitors around us. Which contributed to the diversity Gamescom 2016 doubtlessly had to offer. 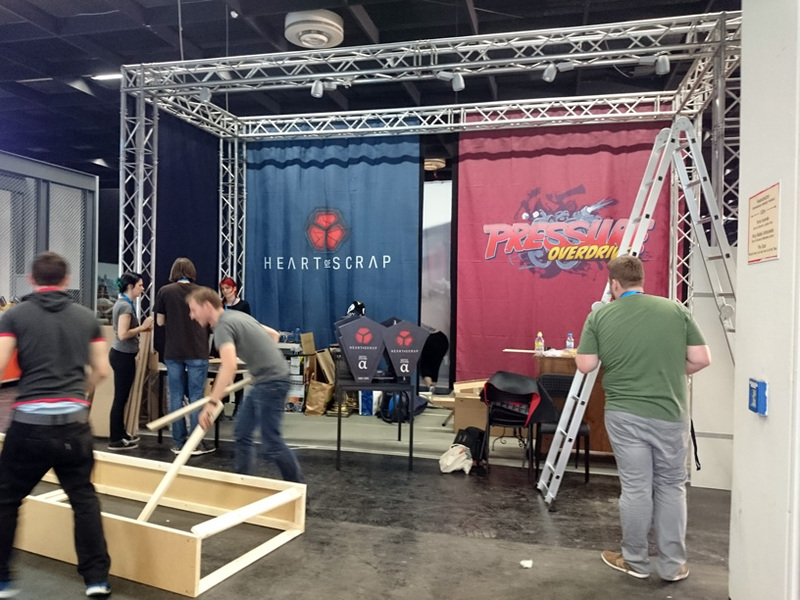 But more important, of course, were the two games we were showcasing this year: Heart of Scrap and Pressure Overdrive. And speaking of diversity, both games offered good reasons for visitors to stop by. Be it thoughtful strategists or action maniacs, our battlestations and arcade couches welcomed many gamers of all ages and origins. Even though it was not the first time we were showcasing on a tradefair, it is always an unique experience to watch people play what we we’ve been developing over the course of months. The focused looks of being immersed, the smiles and shouts while competing with other players… and of course the valuable and honest feedback we have received. Thinking back to those many great moments still gives us goose bumps. And these experiences, our own booth with those two games, again emphasized for us, what it really means to be indy – to shape our vision the way we feel is right and enjoyable. So time did fly by, and all of a sudden Gamescom 2016 was over. Five days of not only presenting our own games, but also playing many other, from intense VR titles, over AAA creations to highly individual indie projects. Five days of meeting industry experts, passionate gamers, visiting a few parties and getting a glance of the what Cologne has to offer in terms of tasty food. This year’s Gamescom was probably the most exciting one – and definitely not the last. Thank you for your hospitality, Cologne. See you next 2017! Just in time for the Gamescom 2016 in Cologne, where we will be showcasing our two new projects, we’d like welcome you on our new website. Although what you can see is still work in progress, we invite you to click around and get to know who we are and what we do through some first impressions provided here. Of course we will refine the contents over time, including this blog, so stay tuned for more information about our studio and the development of Pressure Overdrive and Heart of Scrap. And of course we are looking forward to get in touch with you and answer your questions or requests… feel free to drop us a line. Last but not least, if you happen to be at Gamescom 2016 in Cologne, Germany, the coming days, we’d be happy to meet you. You can find our lovely booth at Hall 10.1 Booth 050.